Challenge: Linda Septien is a talented voice coach who has worked with people like Selena Gomez and Demi Lovato. Although her star studded client list is extensive, her work was relatively unknown. After several attempts with other agencies Linda Septien came to Lamont PR to get true ROI from an agency. She wanted to gain local, regional, and national exposure. Lamont Strong/Strategy: After comprehensive one on ones and interviews, Lamont PR developed a media pitch strategy tailored to who she was as a brand. Lamont PR knew it wasn’t just any message but the right message that would get Linda her well-deserved press. By strategically picking platforms and crafting unique pitches she has amassed hours of media exposure on TV, in print, radio, and digitally. Challenge: When Barcelona based bridal gown designer Rosa Clara, needed to celebrate her first anniversary of her store in Dallas she turned to Lamont PR. Rosa Clara had a very small budget to accomplish the anniversary event of her dreams but Lamont PR made it possible. Lamont Strong/Strategy: Lamont PR leveraged its network of partners to unify for one charitable cause and accomplish the store’s goals. 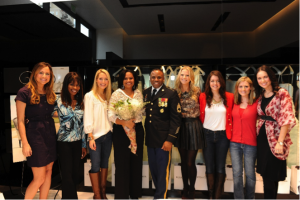 Lamont identified a perfect opportunity to tie the anniversary celebration with the goals of the charity, Hero Bride. Results Matter/Lamont Strong: This compelling match up made headlines for Rosa Clara and the charity Hero Bride. The event was covered in notable D Magazine and fashion blogs. Leveraging cross promotional opportunities services were provided at no cost. Increased brand awareness for the store and the charity’s causes online and in print. Our long standing client Title Boxing has trusted Lamont PR to connect them deeply with their surrounding communities, providing the best promotions, and coverage for their brand. Gatehouse, a nonprofit organization dedicated to assisting battered women. Through identifying mutual goals and having a deep grasp of who they were as a brand, we developed: Empower Hour. Title hosted a special class that focused on women self-defense techniques and a portion of the proceeds benefited Gatehouse. Results Matter/Lamont Strong: The strategic alliance positioned Title Boxing not only as a strong community partner but resulted in hours of media time in digital, print and radio. By understanding their values on an intimate level we were able to create this unique experience that encouraged sales, enhanced brand presence, and landed several media spots. Challenge: The Travel & Adventure Shows has helped over 1.1 million travelers find, plan, and book their dream vacation. They connect quality travelers with top travel providers in the world. With over $2.2 billion in bookings, it is one the largest, fastest growing series of travel shows in the U.S.
With Dallas being one of the most profitable fastest growing economies in the US, they sought to make an impact in the local market to drive event attendance and awareness. Unicomm’s premiere event series, Travel and Adventure Show, knew they needed the right team to make their 5th annual stop in Dallas memorable. Lamont PR took on the challenge. Lamont Strong/Strategy: The Lamont PR team knows time is of the essence so a tailored strategy was key to execution. They developed a bold media placement campaign, 3 weeks leading up to the event date. The plan they developed spotlighted unique elements of the show making every pitch unique. They made the Travel Adventure Show newsworthy not just for a day like typical media coverage but made for a newsworthy week. Leveraging the power of social media and influencer star power from Roger Staubach, they were able to expand the audience reach of each segment to beyond the station’s audience. Challenge: Dallas Law Firm LaSusa & Deb PLLC wanted to reinvigorated their company and place their stake in the Dallas market. They needed a strategy that would drive awareness to their company and create a unique memorable identity. Lamont Strong/Strategy: The Lamont team came up with a comprehensive strategy that was a complete brand overhaul. Lamont redesigned the website, logos, and content. They quickly identified key focus areas to position LaSusa & Deb PLLC as leaders in their field. In collaboration they created Sharks and Heels, a series of events focusing on business law and the types of legal issues budding entrepreneurs need to consider. Results Matter/Lamont Strong: Sharks and Heels became a staple for LaSusa & Deb turning a one- time event into a profitable series.